Blondie Cheesecake & a Keurig Giveaway! Today’s post is a good one guys! This week marks my first year of blogging, and to celebrate I’m doing my first giveaway! It’s been such a great year filled with lots of desserts, videos, sprinkles, and disco dust! I have learned so much this past year, and the biggest thank you goes to all of you! I still can’t believe how many amazing people I’ve met this year, you guys are awesome! Seriously, you have no idea how much I appreciate you reading, watching the videos, leaving comments, and just all your kind words and support. In order to get this party started, I’d like to share with all of you my newest creation, Blondie Cheesecake. I don’t know how I didn’t think of this sooner, two of my favorite desserts hooking up is a very sweet thing! I originally planned on making one big cheesecake, but when I saw these little heart shaped springform pans at the store last week, I knew I had to have them. 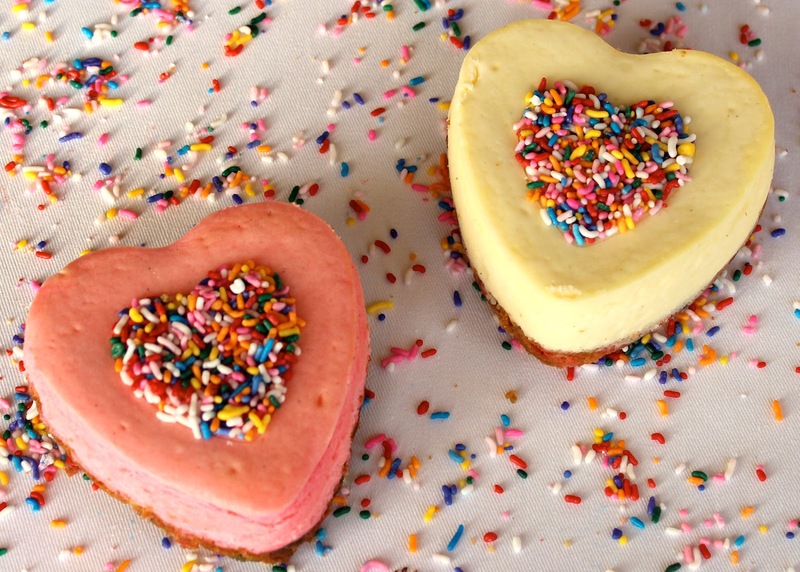 Hearts are right up there with pink, sprinkles, and sparkles! The first thing I did was make some sprinkleized blondie batter. I wrapped it in plastic and refrigerated it overnight so it would be easier to potion out. The next day I baked them in the little heart pans and they looked so cute! In my opinion the only thing that can make cheesecake even better is pairing it with a great cup of coffee. What’s a party without a present, right?? Thanks to the awesome people at Keurig I’m giving away a Keurig Platinum Brewer! I love my Keurig, and I don’t know how I ever lived without it, so I’m beyond excited to be giving one away! This machine is fully programmable, brews coffee in under a minute, and comes with a K-cup variety pack! Scroll down for details on how to enter! Add cake flour, salt, and baking powder. Stir in chocolate chips, white chocolate chips, and rainbow sprinkles. Wrap the dough in plastic and refrigerate overnight. Divide the dough into 3 oz. portions and press into heart springform pans that have been sprayed with pan spray. Bake at 350 degrees for 20 minutes rotating once halfway through. Preheat oven to 350 degrees. Wrap the springform pans in plastic wrap first then aluminum foil. Cream softened cream cheese and sugar in mixer. Add in corn starch and continue creaming. Add vanilla bean paste and eggs on low till incorporated. Pour filling in prepared pans and place them in a roasting pan. Fill pan half way with hot water. Bake at 350 degrees for 25-28 minutes just until they set. When they are done remove from water bath and set them on a cooling rack. *This recipe makes 8 little cheesecakes. *This giveaway is now closed. Congratulations to Gerry from Foodness Gracious! I hope you enjoy it as much as I do! Giveaway Details: One winner will receive (1) Keurig Platinum Brewer. Giveaway is open to US residents only. To enter the giveaway: Leave a comment letting me know what dessert you love pairing your coffee with. I love pairing mine with cheesecake! 1. Follow Buttercream Blondie via email, RSS, or GFC. Leave a separate comment letting me know you did. 2. “Like” Buttercream Blondie on facebook. Leave a separate comment letting me know you did or that you already do. 3. Follow @Butrcreamblondi on twitter. Leave a separate comment letting me know you did or that you already do. Contest info: Contest will be closed on Friday February 3rd at 12PM. Winner will then be chosen using random.org and notified via email. Winner will have 48 hours to respond to email. If winner does not respond within 48 hours, another winner will be selected.